Wildlife plot management is no longer a secret! High-quality, year-round food plots have been scientifically proven to significantly increase the quantity and quality of wild game on your property. To grow quality plots you need three key ingredients – superior seed blends, the right equipment and the knowledge to know when, where, and how to use each of these correctly. "This new approach to plots provides all of the necessary ingredients to ensure you have a successful nutritional plot program,” states Burley. Here we are in 2016! Since 2008 we have increased our product lines to include two Series of Plotmaster equipment (Hunter Series & Frontier Series) making a total of (15) additional models to our original (4) PE & PM model line up! We currently distribute (9) Models through John Deere/Frontier Equipment, the Frontier Mulch Finisher (MF2204, MF2204P, MF2206, MF2208) & Frontier Plotmaster (FP2204L, FP2204, FP2204P, FP2206, FP2208). In addition to our Frontier Line, we have Plotmaster's end user line, the Hunter Series (PE-301, PE-402, PM-603, PM-803). With the many models available today there is a Plotmaster to fit most all sizes of ATV's including UTV's, sub-compact tractors all the way up to 100hp tractors! Through the years we have developed many partnerships, most recently we have partnered with LandLeader. Through this partnership Plotmaster has had the opportunity to share our product knowledge with hundreds of thousands of households via RFD-TV, which is owned by LandLeader TV. Included in this partnering was the opportunity to work with Mahindra USA and their products. The "Product Spotlight" segments, featuring the Plotmaster along with the Mahindra products, can be viewed on LandLeader.com. In addition, we have made several Sponsorship's/Parings with some exceptional individuals and businesses. Just to name a few: Primal Instinct TV, Final Pursuit TV, Buck Obsession, Appalachian Trophy TV, CampFire Stories, F3 Media, Rizen Media,Wildlife Habitat Solutions, Sweet Addiction TV, Whitetail Properties, Mossy Oak Properties, OutDoor Mash, The OutDoor Shopper, Premier Sportsman Guide, Trophy Taker Outdoors. Not to mention the many new Dealer's that now handle our Plotmaster products! Plotmaster has had many unique opportunities to develop "one of a kind" products for other countries. We produced an Oxen drawn model for use in Kenya, Africa through our contacts at Care.Org. We currently have products in Switzerland doing great work in Permaculture. We also have a distributorship in Brisbane, Australia with QuikCorp, their product line is sold through their subsidiary company, GreenPro OutDoor Services. Our products can be used year round, whether it be gardening in the spring or late summer, spring & fall food plots, establishing firebreaks or maintaining power lines & right-o-ways, all the way to leveling woods roads and driveways. The Plotmaster is low maintenance and extremely user friendly! 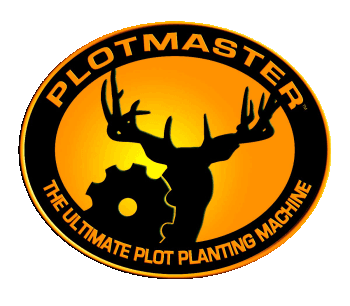 So when considering investing in a Plotmaster product, always remember our products are not just limited to food plot planting!